The new K3 ECU is the most significant step forward for Emerald in over a decade of ECU design, development and manufacture. The new firmware and software packages take Emerald into a realm where it can stand comparison with systems costing up to three times as much. For example the K3 has a CAN bus (controller area network) and now links direct to the AIM dashboard. When you check out the new features that come as standard with the Emerald K3 ECU I think you will agree that you cannot find better value for money anywhere in the ECU market place. Considering the ability to upgrade our previous 32 bit M3Dk to the latest specification, it makes the decision to purchase an Emerald ECU a true performance investment: Emerald - here today and here tomorrow. Currently standard production ECUs have a self learning system for the fuelling which ensures that the air to fuel ratio remains where the car manufacturer meant it to be. This has only been possible with the development of the wide band lambda sensor. Consequent mass production of wide band sensors has now made these affordable to car builders and modifiers working on a budget. The new K3 software and firmware package includes an adaptive mapping system but unlike the OE systems our target maps are fully adjustable by you, the end user. The adaptive learning map exactly overlays the base fuelling map so you can have exactly the air to fuel ratio that YOU want anywhere in the speed and load range. The target and correction maps are now colour coded so you can instantly identify rich or weak areas (red is rich and blue is weak). This is yet another example of Emerald’s hands-on approach to ECU software design; practical as well as pleasing to the eye. Need more flexibility? 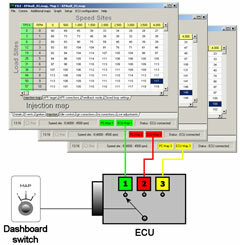 You have a fourth adaptive mapping screen that allows you to switch from closed loop to open loop to adaptive mapping from one load cell to another (feed-back mode) – giving you total control at all times. maps in the ECU. That’s real flexibility. Boost control against engine rpm is an essential part of turbo control but the better systems have always had boost control against throttle position as well as rpm. This gives you the ability to back off the boost as you lift the throttle – giving much more control than the all-or-nothing approach of some systems. Emerald has now added boost control functions input from the gear ratio. With input from a road wheel sensor the ECU calculates which gear you are in and therefore you can run different boost levels in different gears. There is also the facility to have the boost control over-ridden from a control knob on the dash giving the driver total control over the engine boost parameters. By adding this to the triple map switching facility we believe there has never been a more flexible system on the market at this price. The K3 ECU can now trim cylinders on an individual basis allowing simple calibration of unmatched injectors or fuel and ignition trims to suit individual cylinder efficiencies. Each cylinder can be trimmed with positive or negative gains. gas temperature is a critical measurement for high performance engines. live mapping screen allowing you to monitor the engine during mapping. Emerald has always been proud of the speed capability of the system. Previously we had 32 speed sites at 500rpm intervals giving a total rpm span from Zero to 15,500rpm. The system has been bench tested on a simulated 36-1 trigger wheel to a staggering 44,000rpm - before it started to lose accuracy! We were confident that our 15,500rpm rev limit was no idle boast but to the best of our knowledge nobody has ever made use of it. Users were therefore asking for more speed sites over a lower speed range. Consequently the K3 software package allows you to move the speed site position; which means you can shuffle the sites down the rpm range and have them anywhere you like. We wanted to give even the most demanding customer no cause for complaint so the resolution on site setting is one rpm (1 rpm). You can space them anywhere you like, even or uneven and all speed related events, like warm up tables, ignition sites, etc, move position to stay in alignment. This means you can move sites half way through mapping and carry on as if nothing had changed: practical as well as clever. It’s the same story with load sites. Rather than having them fixed you can now move them to a resolution of one percent (1%) and with so many new throttle body designs coming onto the market this allows you to set up the maps for traditional butterfly bodies or roller barrels – whatever the design. Should you feel the need to experiment you can have different speed and load sites on each of the three available maps. Load can also be read from a manifold air pressure sensor rather than throttle angle simply by changing the software configuration. Traditionally, with an eye on simplicity, we at Emerald have stayed with one fixed air and one water temperature sensor calibration file. Due to the wide diversity of applications now available we have subsequently included the ability to user define the sensor calibration. Since we doubted that many of our customers would have access to climate chambers we have adopted a clever software strategy for sensor calibration. You enter the sensor value at ambient (room) temperature. Next you place the sensor in ice and record the value at zero degrees C. Follow this up with boiling water (100 degrees C) and the software does the rest. A true parabolic curve is drawn through all three points allowing you to calibrate almost any sensor to the system with little more than domestic equipment available around the house (most people have a fridge and a kettle). Wherever we can we like to make the complicated as simple as possible. Injectors can now be calibrated for changing supply voltage with the “user defined” option. Over the last ten years we have seen power outputs in the tuning industry climb ever higher. Ten years ago 200bhp was an outstanding engine; currently it is not an uncommon output for a fast road conversion. This has meant that a wide range of larger injectors are now being used and many have wildly different requirements on voltage correction. We are currently working on building up a library of correction curves for the most common injectors. our policy of NEVER sending out an ECU without a suitable base map. can download the software for free and explore the system more fully for yourself. growing family of satisfied Emerald ECU users.